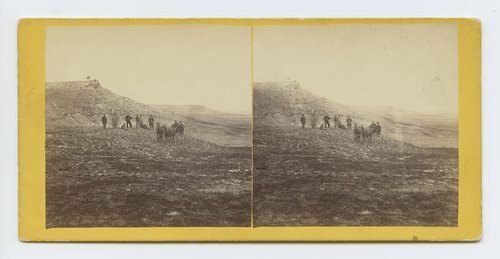 This stereograph shows men standing and sitting on land west of Fort Hays, Ellis County, Kansas. Visible in the stereograph is a horse drawn carriage. It is from Alexander Gardner's series, Across the Continent on the Union Pacific Railway, Eastern Division. View on the Plains, Kansas, six miles west of Fort Hays. 586 miles west of St. Louis, Mo.